In olden days — say, 5 years ago — home recording studios were not common among voiceover talent. Today, though, having your own recording studio has become a necessity to compete in this industry. I am meticulous about editing out undesirable sounds to provide a pristine recording to my clients. This :41 video shows you how to isolate and eliminate a click from your recording. I use Pro Tools LE, but this technique should work with any audio editing program. Since editing is done in real time, you can just imagine the amount of time needed to edit your recording of a long video or e-learning narration, much less an audiobook! When quoting a price for a job, you always have to factor in the time required to edit the audio. In fact, the general rule of thumb that I use is to expect 2 hours of audio editing for every 1 hour of finished recording. Was this video helpful to you? Are there other audio editing techniques that you would like to see? 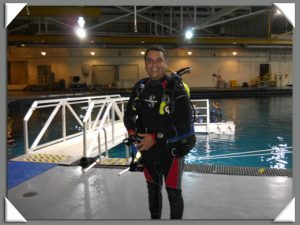 I look forward to your comments on the blog! The title of this article is a saying I heard early in my IRS career. Sorry if it offends you, but it really gets to the heart of stellar customer service. No matter how many great and wonderful things you do for your clients, the thing they will remember most — and tell the most people about — is the thing that got screwed up. As Drew and I continue to repair and renovate our house, I’m finding no shortage of contractor stories to share with you that illustrate this principle. By observing other business operators, we can determine how to better service our clients in our voice-over businesses….and hopefully avoid some of those “Oh s****” moments. Today, I actually have 2 contractor stories. First, I have an example of fantastic customer service from start to finish. 1) He arrived exactly on time, which is a rarity for service provider at one’s home. Punctuality is key in voiceover as well. When I started my voiceover business, I assumed that all voiceover talent were punctual. Over the years, I’ve been surprised to read about people who didn’t show up or were late to sessions, didn’t return phone calls, etc. 2) He suggested features we hadn’t considered, like a dimmer for the recessed lights and a remote control for the ceiling fan. I do the same thing with my clients. For instance, if I was hired to narrate a marketing video for a trade show, I’ll also let the client know that they may want to use the same voice on their phone system, e-learning modules, and web site to enhance and solidify their brand. It may seem like a self-serving piece of advice, but it’s really about helping my clients achieve consistency in all of their communications. 3) He finished the job in LESS time than he estimated, so our bill was less than expected. He told me he always builds in enough time in the estimate to troubleshoot any problems — a tactic that voice talent would do well to emulate. Tommy told me that his business is mostly through repeat business and referrals. In my voiceover business, I always want to make it easy for my clients to refer me. With his terrific attention to detail and exemplary customer service, it’s truly a pleasure to refer Tommy to other people. My second story is about my new roof. We learned about Everdry Roofing because someone there follows Drew on Twitter, which just goes to show you the growing importance of social networking in attracting clients. I thought Everdry was going to be a second success story of stellar customer service. After all, they showed up when promised, explained shingle options, worked with our insurance company on our claim, and did a great job of cleaning up the nails and other debris from the yard. They were providing exceptional customer service — that is, until the “Oh s***” moment. In the picture below, your eyes are not drawn to my new roof, with its lovely architectural shingles and new ridge vent. No, instead you see the massive steel container stretching over half of my driveway. 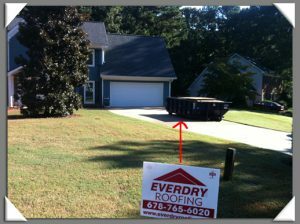 In fact, Everdry’s sign in my yard points directly to it. The “Oh s***” moment from the roof installation has lasted all weekend. The roofers were here Thursday and part of Friday. I wasn’t at all happy about the container staying overnight on Thursday since it blocks the garage. The project manager assured me at 6pm Thursday that the container would be removed Friday. Today is Sunday, and the container is still here. I haven’t heard from Everdry about their plans to remove it. If Drew and I had 2 cars like every other household in Atlanta, one of those cars would be trapped in the garage or parked on the street all weekend. As it is, we have to cautiously back out over our grass to clear the side of the container. To make matters worse, the smell of 23-year-old shingles removed from the roof and the other materials in the container is akin to the putrid stench of animals killed in the road. Every time I walk out of my house, that nasty smell hits me in the face. We’re still having 90-degree days, so you can just imagine how the smell grows as the day progresses. As a voiceover talent, I always think of how to provide the best level of service to exceed my clients’ expectations. I certainly don’t want them to incur any inconvenience as a result of my actions! If they have given you a file naming convention, use it. If not, be very descriptive with your file names so that the purpose or script for each file is immediately evident. If you have to revise a file, add a revision number to the file name so that you don’t inadvertently write over an existing file. Sometimes, the client may decide the original file was best after all or wants to make some other change to it. Compress multiple files into a zip file so that the client only has to download one file. By being organized and forward-thinking, you can rack up the “Attaboys!” and “Attagirls!” in providing stellar service to your voiceover clients. If you have other examples of stellar service, please leave a comment on the blog!